When we did our gin tasting, we sampled them as you did and then in Gin and Tonics. We got wildly inconsistent results, but it was fun, nonetheless. I’d definitely give the taste test a try with martinis. We’ll have to try the G&T tasting, too. That’s a great idea. At room temp, the Bulldog had some nice citrus notes, and I think it’ll do quite well in a G&T or in a twist-of-lemon martini. We held a gin tasting a few months ago at one of our monthly meetings. 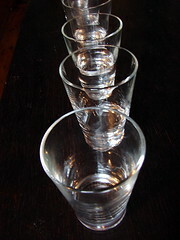 The consensus was that we did gain some useful information from the room temperature tasting (such as though that feature heavy citrus notes over botanicals), however we felt that we should have followed it with a chilled tasting considering this is the form in which most people consume their gin. Perhaps we should all try again and compare notes…we are always looking for another reason to taste delicious gin! Next time consider diluting the spirit, with a neutral tasting water, to about 20% alcohol. I find that brings out flaws you might not otherwise find, and it also makes it easier to taste them. Then I take the ones that held up in round one and taste them both with tonic and then washed, since that’s more like the way normal people actually drink the stuff. I don’t use vermouth because they vary so much and seem to combine differently with different gins. Until recently there were few tonic choices, but now I think I would probably use Fever-Tree.